Is this game not turtly enough for the 3DS? We all know that mobile gaming on smartphones is big. Even though a lot of gamers hate mobile gaming, it still has a huge market. A majority of mobile games are only $0.99, which is good for the consumer, but in my opinion it has seriously killed the value of video games. While I could go on and on about this subject, I won’t. The 3DS is starting to see cheaper games, games that are competitive with the mobile market. Turtle Tale is one of them. Does Turtle Tale bring quality gaming for cheap on the 3DS? Possibly. I have no idea what the story of Turtle Tale is; there is virtually no storytelling involved. What I do know is you are a turtle with a water gun that you use to shoot different enemies; you also collect fruit, and it’s all wrapped up in a 2D platformer. The graphics are pretty simple, but that's not a bad thing; the backgrounds looks nice, and the 3D is at a sweet spot in-between too strong and too weak. The music is great; the soundtrack fits nicely with each set of levels, and the different tunes are very relaxing. There are three big problems with Turtle Tale. First, it’s short, I mean very short. You could easily beat it within two hours. There is a second quest that can be unlocked after collecting all the fruit, and the fruit is easy to collect. Second, it’s not hard. You have unlimited lives, and most of the enemies are easy to beat. Third, there are zero upgrades; you play the whole game with the same equipment you started with. I enjoyed playing Turtle Tale, but after beating the final boss I felt like I’ve played enough. 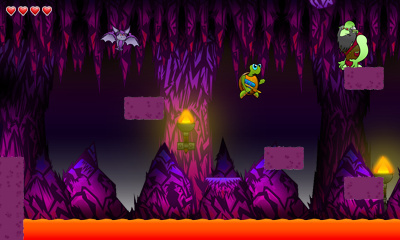 Turtle Tale feels like a smartphone game that is on the 3DS eShop; it’s simple, short, and easy. Sometimes simplicity is good, and Turtle Tale’s simplicity works well. However I can imagine Turtle Tale is better suited for younger kids and parents who want to play something casual other than Farmville or Angry Birds. While not for the gamer that loves 100 hour RPGs, at $2.99, it’s good for anyone who wants to play a simple, low priced game. However if you are looking for a massive and complicated game, look somewhere else. This game looks reminiscent of the TG-16 Adventure Island games in the screenshots that you used! Thanks for yet another superb review. Dat tagline! xD I doubt that I'll dl this game. I found the game too turtly. Oh wait you did mention it. I like how in-depth your reviews are. Nice work!